IMPHAL, Mar 30: Chief Minister Nongthombam Biren visited the injured victims of the motor accidents that took place along Imphal-Dimapur highway and Imphal-Jiribam highway on March 27 who are currently undergoing treatment at different hospitals. 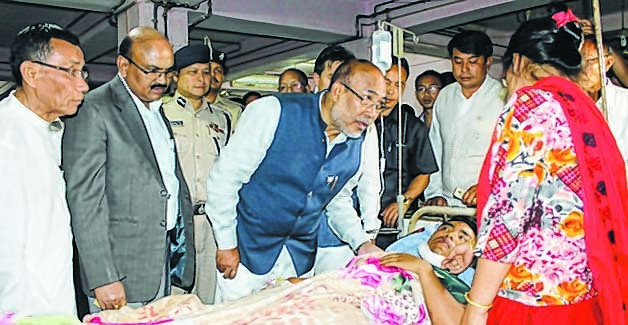 Chief Minister N Biren visited the injured victims together with Works and IPR Minister Th Biswajit at different hospitals yesterday. Altogether nine victims are undergoing treatment at RIMS, one at Shija Hospital, three at Raj Medicity and 12 at JNIMS. The Chief Minister and the Works Minister visited them yesterday. As announced earlier, monetary aid of Rs 50,000 was given to each of the victims who suffered serious injuries and Rs 30,000 each to those who suffered simple injuries from the Chief Minister’s Relief Fund. Speaking to media persons after visiting the accident victims, N Biren lamented that he could not meet families of the deceased victims as he was out of station when the accidents occurred. He continued that he was visiting the injured victims as he wished to extend some aid. A Ministerial team inspected the accident sites while Deputy Chief Minister Y Joykumar and Health Minister L Jayantakumar visited the injured victims at different hospitals on the day the tragic accidents took place, Biren stated. The two National Highways which serve as the State’s life lines would be upgraded to the level of Asian highways. The Central Government has already given its consent to open trauma centres near the National Highways, Biren stated. He further informed that he discussed with Central leaders about introduction of air ambulance service by using helicopters to cater to emergency medical requirements in interior and remote areas of the State. The Chief Minister and the Works Minister were accompanied by Additional Chief Secretary (Home) Dr J Suresh Babu, Additional Secretary (Home) M Yaiskul and DGP LM Khaute.